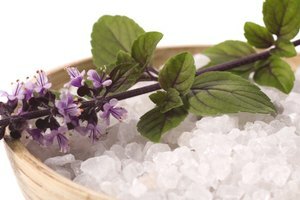 Salt has been used throughout history as a natural cleaning product, as well as an oral irrigator and a cleanser for wounds. Additionally, a 2010 study by the Mayo Clinic showed that salt water reduces cold symptoms, including the pain of sore throats, when used as a gargling agent. The salt draws the moisture away from the inflamed area to clear away bacteria and fungus, while reducing mucus. Warm salt water can be used a few times daily to disinfect the affected area. Run water from the kitchen tap until the temperature is warm. Fill an 8-ounce cup with the water and add 1/2 teaspoon of salt. Stir vigorously to dissolve the salt. Pour the mixture into your mouth to treat gingivitis, canker sores or after oral surgery. Move the salt water from side to side, concentrating on the affected area. If you have gingivitis, make sure to use your mouth muscles to pull the liquid between the teeth. Spit out after 30 seconds. Repeat after every time you eat for one week. Fill your mouth halfway with the salt water mixture if you have cold symptoms. Tilt your head back and gargle for three seconds, and spit out the liquid. Repeat three times daily until cold symptoms subside. Saturate a cotton ball into the glass of salt water if you need to disinfect a wound. Dab the cotton ball on and around the wound to clean. The goal is to remove any dried blood or seepage from the wound. Pat dry with a soft cloth and recover, if applicable. If symptoms worsen, call your physician immediately.